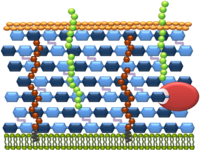 The cell wall of Gram-positive bacteria is made of a complex and dynamic assembly of different glycopolymers (peptidoglycan, polysaccharides, teichoic acids) and proteins. It is a rigid structure to maintain cell shape and integrity but also a flexible one to accommodate cell growth and division and to face changing environmental conditions. Besides, the components exposed at the bacterial surface determine the interactions of bacteria with their surrounding biotic medium in complex environments such as the gastrointestinal tract as well as in artificial niches such as food fermentation systems. Our work focuses mainly on lactic acid bacteria used in food technology or for their beneficial health effects, including Lactococcus lactis, the model food bacterium and several species of lactobacilli present in the gut microbiota and / or having probiotic properties. We aim to understand how the composition of the bacterial cell wall and the structure of its components impact essential properties for their use, in particular their sensitivity / resistance to bacteriophages during food fermentations or their ability to interact with the cells of their host . 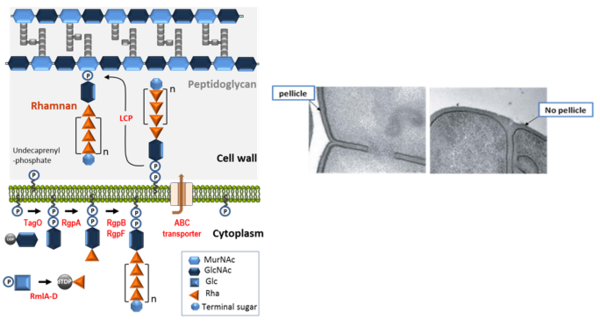 1) the structure, biosynthesis and structural modifications of cell wall glycopolymers in particular peptidoglycan and cell wall polysaccharides. 2) the regulation mechanisms of the equilibrium between synthesis and degradation of the cell wall. 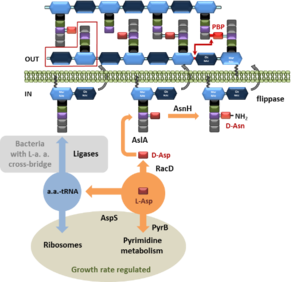 3) the role of cell surface glycopolymers in bacterial physiology (growth, division, stress response, autolysis), as phage receptors at the bacterial surface or in bacteria-host interactions. In Gram-positive bacteria, the peptidoglycan sacculus is decorated with other glycopolymers including polysaccharides, the roles of which are not fully elucidated. We have shown that L. lactis synthesizes complex cell wall polysaccharides with a conserved component (a rhamnan chain) and a variable one exposed at the bacterial surface (the pellicle) (Chapot-Chartier et al., 2010 ; Sadovskaya et al., 2017). Rhamnan appears as a conserved constituent of the lactococcal cell wall playing an essential role in growth and division, thus highlighting the importance of polysaccharides in cell wall integrity of Gram-positive cocci with ovoid shape. Moreover, in a collaborative work with University College Cork and CNRS (AFMB in Marseille), we have shown that the variable pellicle at the bacterial surface is the receptor of the major families of bacteriophages infecting L. lactis, thus explaining the narrow host range specificity of these bacteriophages (Bebeacua et al., 2013 ; Ainsworth et al., 2014). Current work aim at deciphering the molecular basis of the cell wall polysaccharides structural diversity and their biosynthesis pathway in relationship with their specific recognition by bacteriophage proteins. To ensure optimal cell growth and separation and to adapt to environmental parameters, bacteria have to maintain a balance between cell wall rigidity and flexibility. In search for new regulatory mechanisms responsible for maintenance of such an equilibrium in L. lactis, we identified the pivotal role of the pyrB gene in the regulation of cell wall rigidity. Conversion of L-aspartate (L-Asp) to N-carbamoyl-L-aspartate by PyrB may provoke a lack of L-Asp for PG cross-bridge synthesis, resulting in a decrease of PG cross-linking and, consequently, reduced PG thickness and rigidity (Solopova et al., 2016). We hypothesize that the concurrent utilization of L-Asp for pyrimidine and PG synthesis may be part of the regulatory scheme, ensuring cell wall flexibility during exponential growth and rigidity in stationary phase. Bacterial cell wall components are considered as important molecular effectors of the dialog between beneficial bacteria present in the gut microbiota and their host, maintaining intestinal homeostasis. Lactobacillus plantarum is a dominant species of the Drosophila microbiota. A collaborative work with ENS in Lyon has shown that D-alanylation of teichoic acids contributes to Lactobacillus plantarum-mediated Drosophila growth during chronic undernutrition (Matos et al., 2017). 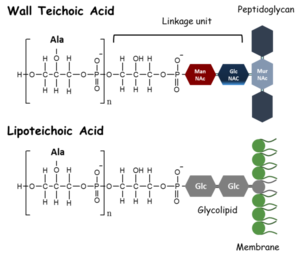 This allowed concluding that, beside peptidoglycan, teichoic acids modifications participate in the commensal-host molecular dialogue occurring in the gut, thus suggesting that D-alanylated teichoic acids may be sensed by the host by yet-to-be-discovered mechanisms. In addition to cell wall polysaccharides, certain lactic acid bacteria synthesize exopolysaccharides (EPS) that are secreted into the surrounding medium but can be also loosely attached to the cell surface. They have traditionally been known in the dairy industry for their contribution to the texture of fermented milk products, but may also contribute to health properties of probiotic LAB, such as their immunomodulatory potential. We have isolated spontaneous non-GMO EPS overproducing L. rhamnosus mutants using a method based on differential sedimentation during bacterial growth in semi-liquid medium conditions. In addition to their technological interest, these strains constitute valuable tools for further investigation of biosynthesis and anchoring/secretion of polysaccharides in lactobacilli.